I will be watching the Samurai TV version of the show, so some matches may be clipped. As always, all the wrestlers above have a profile on Joshi City, you can click on their name to go straight to it. The show begins with a battle royal putting the rookies with veterans that had nothing else to do on this show. 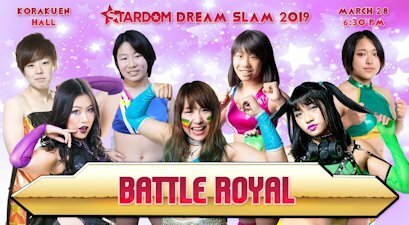 With so many singles matches, wrestlers like Jungle Kyona and Natsu Sumire are in a position they are rarely in – kicking off the show. Hana Kimura was supposed to be in this match too but missed the event due to an injury. This is the “get everyone on the roster on the show” match but should be mindless fun anyway. As an added note, tonight will also be the final appearance by Nao Yamaguchi as Oedo Tai’s manager as she is retiring after today’s show, she’ll be ringside for Natsu Sumire. As with most Battle Royals, it is an elimination match with eliminations taking place by pinfall, submission, or Over The Top Rope. All seven start the match together, Natsu armdrags all the rookies but can’t get Jungle over. Nao Yamaguchi trips Jungle from the apron and with Natsu they double team her, boot to the back of the head by Jungle but her cover is broken up. The rookies isolate Jungle in the corner and all connect with dropkicks, Hanan puts Jungle in a headscissors and the other rookies follow down the line, with Natsu on the end as all seven wrestlers are in headscissors. Nao comes in and rolls them over, after a moment the hold is broken up and Jungle is triple teamed by Hanan and her two sisters. Leo tries to help but just makes it worse for Jungle, so Saya comes in and finally breaks up the hold. Hanan and her sisters all hit judo throws, but Leo levels Hanan with a hard elbow. Hanan rolls up Leo and with Hina and Rina’s help they hold her down, getting the three count! Leo Onozaki is eliminated. Hina and Rina then quickly cover their sister and get a three count as well! Hanan is eliminated. Natsu and Jungle get back in the ring but Jungle dropkicks Natsu back out of it, Rina and Hina try to double team Jungle but Jungle slams both of them. Jungle puts them both in a joint crab hold, and they both submit! Hina and Rina are eliminated. Natsu attacks Jungle from behind and kicks Saya when she returns, Natsu gets them both seated in the corner and delivers a Bronco Buster. Bridging suplex by Natsu to Jungle, but it gets two. Nao Yamaguchi comes in the ring but Jungle kicks her back, Jungle goes for a lariat on both of them but they move and Jungle falls over the top rope. She hangs on but Natsu dropkicks her from behind, sending Jungle to the floor! Jungle Kyona is eliminated. Natsu and Saya are the last two left. Saya tries to dropkick Natsu over and finally does so with a dropkick to the knee, another dropkick by Saya but it gets two. Nao slides Natsu a whip of sorts and she hits Saya with it, Nao gets into the ring but she lariats Natsu by accident. Saya quickly bridges over Natsu to cover her, and she gets the three count! Saya Iida wins! This is the first pinfall victory in Saya Iida’s career. For what it was, they managed to squeeze quite a few fun spots into a short battle royal match. The spots with Hanan and her sisters were cute, and Nao Yamaguchi being such an active participate was fitting since this was her last appearance in Stardom. A perfectly fine way to start a show, even though its a shame Jungle Kyona didn’t have something better to do. 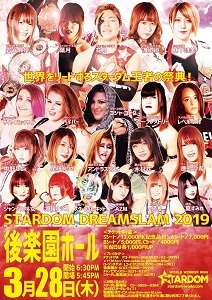 Queens Quest and STARS collide at Stardom Dream Slam! One of the benefits of the faction system is it allows the promotion to give a bit more meaning to their undercard matches. Neither team has their top wrestler, Momo Watanabe and Mayu Iwatani respectively, so its a pretty fair match. Some of these wrestlers have fallen in a rut and may benefit from the upcoming draft, as Konami and Saki Kashima in particular need a boost. Nothing on the line besides faction pride, I assume one of the children will get pinned but with this much variety the result is really up in the air. Viper and Starlight Kid start the match, Starlight Kid tries to dropkick Viper over but naturally fails. Jumping crossbody by Viper but Starlight Kid barely kicks out, the rest of the STARS run in to help and all eight wrestlers end up in the ring. Queen’s Quest stacks their opponents in the corner but they roll out of the way of Viper’s cannonball attempt, Queen’s Quest dropkick Viper in the legs to get her to the mat and Tam delivers a neckbreaker. Things calm down a bit as Saki is tagged in as legal, Saki goes for a headscissors but Viper catches her and hits a backbreaker. The rest of Queen’s Quest runs in as they all apply submission moves on STARS, Viper goes off the ropes but Saki avoids the senton. Saki elbows Viper but Viper headbutts her and tags in Bea. Springboard hurricanrana by Saki and she tags Arisa, Tam comes in too and they both boot Bea in the face. Tam slams Arisa on top of Bea and stands on her, Arisa returns the favor and slams Tam on top of Bea. Springboard double knee by Arisa, but Bea kicks out. Arisa goes up top but Konami runs over and kicks her in the head, Bea gets Arisa on her shoulders but Tam kicks Bea while allows Arisa to roll her up for two. Bea picks up Arisa and hits a jumping kick out of the corner, Bea gets Arisa on her shoulders and hits a jawbreaker which gives her time to tag AZM. Starlight Kid tags in too, they go through a quick exchange which ends with AZM delivering a dropkick. The rest of STARS comes in to help, German suplex by Tam and Starlight Kid holds down AZM for a two count. Queen’s Quest arrive to swing the match back in their favor, they stack STARS in the corner and this time Viper successfully hits the cannonball. Vertical suplex by AZM to Starlight Kid and Konami connects with the sliding kick, diving footstomp by AZM and she covers Starlight Kid for two. AZM goes for an armbar but Starlight Kid quickly gets out of it, cradle by AZM and she picks up the three count! Queen’s Quest wins! For being such an inexperienced wrestler, this is a really tough spot for Utami. Rossy Ogawa loves to pit his best wrestlers against random Gaijin, we will see that again a few matches down the card, but it doesn’t always have great results. 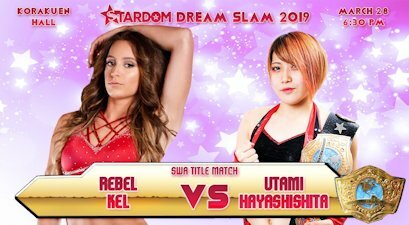 I have never seen Rebel Kel before as she is a relatively unknown from the West Coast of the US, but based on her age/experience combined with the language barrier (Utami speaks virtually no English) this may be a rough match. Utami of course is Stardom’s Big Rookie and holds four titles, arguably her most prestigious title is on the line here but from the spot on the card it was clear the expectations were low. Hopefully they have some natural chemistry, it will be needed. Rebel Kel has the height advantage on Utami which she uses to get control early on, Irish whip by Rebel Kel and she hits a spinning back elbow. Rebel Kel knocks Utami into the corner and hits a neckbreaker, strikes by Rebel Kel but Utami dropkicks her in the back of the leg. Another dropkick by Utami and she goes for the sleeper, but Rebel Kel tosses Utami down to get out of it. Elbow by Rebel Kel but Utami throws her into the corner, Utami charges in but Rebel Kel boots her in the face. Another boot by Rebel Kel and she connects with the Diamond Dust, Rebel Kel goes for a suplex but Utami lands on her feet. Rebel Kel knocks Utami into the corner and delivers a high kick, Falcon Arrow by Rebel Kel and she covers Utami for two. Utami gets her own quick two count, Rebel Kel goes off the ropes but Utami hits an armdrag. Chokeslam attempt by Rebel Kel but Utami hangs on with a guillotine, Rebel Kel slams Utami into the corner to get her off and puts her on the second turnbuckle. Rebel Kel joins her but Utami pushes Rebel Kel off, Rebel Kel charges back with a lariat however which sends Utami to the mat. Rebel Kel climbs the turnbuckles but Utami grabs her from behind and nails a German suplex, cover by Utami but it gets two. Utami picks up Rebel Kel and gets her briefly up on her shoulders, but Rebel Kel slides off and drops Utami with a chokeslam. Utami recovers and applies a guillotine but Rebel Kel slams out of it, Rebel Kel drags up Utami and throws her into the corner, but Utami boots her when she charges in and applies the sleeper. Rebel Kel starts going to sleep, Utami quickly releases the hold and gets her up into the Argentine Backbreaker before slamming her down to the mat. Cover by Utami and she picks up the three count! Utami is still the champion. While I can’t say I came away from the match impressed with Rebel Kel, Utami looked like a ring veteran here and kept the match together with her great selling and timing. I can’t judge Rebel Kel as a wrestler overall just based on one match, particularly one in a foreign land, but she wrestled pretty soft and there were a lot of moves that weren’t hit very crisply. Utami looked great as she tends to and showed her strength by still hitting her finisher against a wrestler much bigger than she is. Not an award winning match by any means but it does show how far Utami has already come as a professional wrestler. Since winning the High Speed Championship in December, Hazuki has been on a tear as this is already her fourth defense of the title. 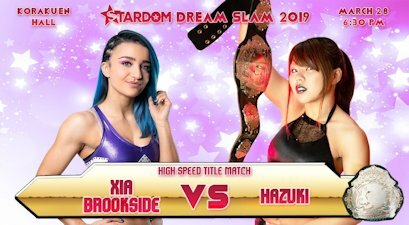 Hazuki has really improved since joining Oedo Tao last Spring and looks to continue her winning ways against UK’s Xia Brookside. Xia is no stranger to Stardom but hasn’t been around in awhile as she is now signed to WWE NXT UK. But before heading back to England she has the chance to beat Hazuki and take the belt back with her. Xia charges Hazuki as the bell rings but Hazuki moves, spinning headscissors by Xia and she connects with a dropkick. Running double knee in the corner by Xia but Hazuki trips her and knocks Xia into the corner. Snapmare by Hazuki and she kicks Xia in the head, dropkick by Hazuki and she facewashes Xia while she is against the ropes. She goes for the boot but Xia moves and dropkicks her, Hazuki goes for a Codebreaker but Xia pushes her off. DDT by Xia but Hazuki knocks her back and this time connects with the Codebreaker, both wrestlers slowly get up and trade elbows. Elbows by Xia but Hazuki ducks one and throws Xia into the corner, but Xia jumps on the second turnbuckle and hits a crossbody. Face crusher by Xia, she picks up Hazuki and throws her into the corner, getting her into the Tree of Woe before delivering a dropkick. Xia picks up Hazuki and hits a neckbreaker, cover by Xia but it gets two. Xia throws Hazuki into the corner and sits her on the top turnbuckle, Hazuki kicks Xia away and sneaks in an inside cradle for two. They trade flash pins with neither having any luck, Hazuki quickly applies La Magistral and she picks up the three count! Hazuki wins and is still the champion. Our run of title matches continues, with Mayu defending a Ring of Honor championship in the Stardom ring. Mayu won the title from Kelly Klein on February 10th, and this is her third defense of the championship. 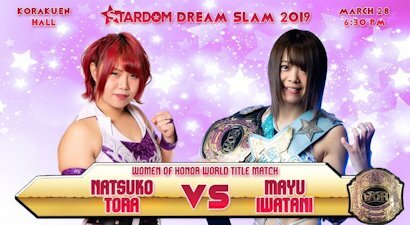 Ring of Honor and Stardom have had a loose agreement since last year, the Stardom wrestlers don’t mix it up often in Ring of Honor so it was a big deal when Mayu win their women’s championship. Natsuko Tora has zero chance of winning this match for a variety of reasons and is a pretty low-level challenge, but its her biggest singles match to date so she has a real opportunity here to show both fans and management what she can do. Mayu and Natsuko shake hands before the match, but Natsuko tackles Mayu when she turns around and starts working on her already injured leg. Mayu rolls out of the ring to re-group but Natsuko goes out after her and slams her onto the floor. Natsuko sets up a chair at ringside and twists Mayu’s leg in it before dropkicking the leg, she then throws the chair at Mayu before finally returning to the ring. Natsuko goes out after Mayu and slides her into the ring, scoop slam by Natsuko and she covers Mayu for two. Natsuko goes up top but Mayu recovers and slaps her before she can jump off, Mayu joins Natsuko and delivers the Frankensteiner. Natsuko charges Mayu but Mayu moves out of the way, Mayu goes for a kick but Natsuko knocks her bad leg out from under her and applies a crab hold. Mayu gets to the ropes for the break, elbows by Natsuko and she goes off the ropes, but Mayu delivers a superkick as she goes for the spear. Kick to the midsection and head by Mayu, she goes off the ropes and dropkicks Natsuko while she is against the ropes. Natsuko falls out of the ring, Mayu goes up top and dives down onto Natsuko with a diving crossbody. Mayu slides Natsuko back in and goes up top again, hitting a missile dropkick. Again she goes to the top turnbuckle and this time delivers a diving footstomp, but her knee is too hurt for her to make a quick cover, and Natsuko kicks out once she finally does. Moonsault off the second turnbuckle but Natsuko avoids the moonsault from the top, sliding knee by Natsuko and both wrestlers down. Natsuko picks up Mayu but Natsuko slides away and hits a superkick, Dodonpa by Mayu but Natsuko gets a shoulder up. Mayu picks up Natsuko but Natsuko blocks the dragon suplex attempt, spinning backfist by Natsuko and she hits a second one for a two count. Natsuko picks up Mayu but Mayu slides off her shoulders, uppercut by Natsuko and she hits the rolling fireman’s carry slam. Natsuko goes up top and delivers the diving body press, she goes up top again and hits a diving double kneedrop, but Mayu barely kicks out of the cover. Single leg crab hold by Natsuko but Mayu inches to the ropes, Natsuko goes up top and she hits a diving legdrop to Mayu’s injured leg. Natsuko sets up Mayu and connects with a dragon suplex hold, stealing Mayu’s move, but Mayu kicks out at two. Swinging side slam by Natsuko, but again Mayu gets a shoulder up. Natsuko goes off the ropes but Mayu knocks her back with a superkick, another superkick by Mayu and she knocks down Natsuko with a high kick for a two count. Another kick to the head by Mayu, she goes up top and delivers the moonsault. Dragon suplex hold by Mayu, and she picks up the three count! Mayu Iwatani wins and retains her championship. Like we saw with Utami earlier in the night, now it is Kagetsu that must face the Gaijin Invader. Goya Kong is a Luchadora that has been wrestling since 2006, she is part of the large Alvarado wrestling family that includes the Brazo clan, Psycho Clown, Maximo, and many more. She is currently a Freelancer but wrestles semi-regularly in AAA, usually in the midcard. Kagetsu won the World of Stardom Championship last June and this is her 8th defense of the title, so she has been a fairly active champion. 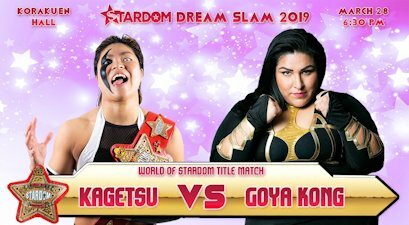 Goya Kong hasn’t been in Stardom long enough to get a good feel on how she will look against Kagetsu, but I imagine this will be a simple story based on their size difference. Goya Kong wins the early power battle as Kagetsu can’t knock her over, while a shoulderblock by Goya Kong sends Kagetsu crashing to the mat. Leg kicks by Kagetsu also have no effect, Irish whip by Kagetsu but Goya Kong reverses it and smushes her against the ropes. Goya Kong knocks Kagetsu into the corner and hits a body avalanche followed by a Stinkface. Goya Kong tosses Kagetsu out of the ring and goes out after her, tossing Kagetsu around the floor. They return after a moment, Irish whip by Goya Kong and she tries to sit down on Kagetsu, but Kagetsu moves out of the way. Scoop slam by Goya Kong and she hits a running elbow drop, face rake by Goya Kong but Kagetsu gets out to the apron and hits a missile dropkick, finally knocking Goya Kong over. Goya Kong rolls out of the ring, Kagetsu gets a running start and dives out onto her with a tope suicida. Kagetsu rolls Goya Kong back in and sprays mist in her face, she gets on the apron and hits another swandive missile dropkick before putting Goya Kong in a kneelock. Kagetsu releases the hold and goes up top, hitting a diving footstomp to Goya Kong’s leg. She goes back to the kneelock but Goya Kong gets into the ropes, Kagetsu goes up top again and hits the Oedo Coaster, but Goya Kong kicks out at two. Kagetsu tries to get Goya Kong on her shoulders but isn’t able to do so, Kagetsu goes for a cradle but Goya Kong blocks it and hits a release German suplex. Both wrestlers slowly get up, Kagetsu charges Goya Kong but Goya Kong levels her with a lariat. Goya Kong gets up Kagetsu and nails a hammerlock sitout slam, cover by Goya Kong but Kagetsu barely gets a shoulder up. Scoop slam by Goya Kong and she gets on the second turnbuckle, but Kagetsu sprays green mist in her face. Kagetsu gets Goya Kong on her shoulders and hits a Samoan Drop, Kagetsu gets on the top turnbuckle and delivers a Oedo Coaster. Kagetsu quickly goes back up top and hits a second Oedo Coaster and then a third, cover by Kagetsu and she gets the three count! Kagetsu retains the championship. To say that Goya Kong is limited would be an understatement and there is a reason that a 10+ year veteran has never won a title. This match was really simple but the story was told well enough. The random leg work by Kagetsu didn’t mean anything and could have probably been safely skipped, if you are still doing limb work 75% of the way through the match I’d prefer it play into the ending in some way. Goya Kong of all wrestlers being the one that it takes three Oedo Coasters to beat was a bit eye-rolly but they wanted Kagetsu to get an emphatic win so I guess it worked in that regard. In the end this was a forgettable title defense and was more here to satisfy Rossy Ogawa’s urges to have his wrestlers beat big Gaijins than anything else. 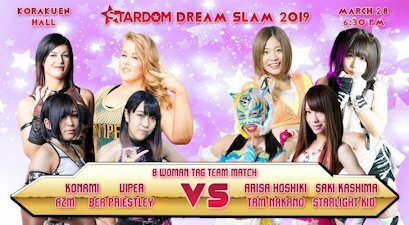 And it is time for the Stardom Dream Slam main event and fifth straight singles championship match. Momo Watanabe is having a historical title run, as she won the championship back in May of 2018 with this being her 12th title defense. At the moment she is the undisputed Ace of Stardom, as she has beaten everyone in title matches along the way (except Kagetsu). Andras Miyagi joined Stardom in February from Sendai Girls’ and immediately is making her presence felt, as she tries to win one of the top titles in Stardom. Even though Momo is only 19, she’s one of the best wrestlers in the world and Miyagi has her work cut out for her if she wants to keep up with her and take her title. They tie-up to start, Miyagi works a headlock and Irish whips Momo but Momo slides behind her and they trade waistlocks. Armdrag by Momo but Miyagi avoids her kick and boots Momo out of the ring. Miyagi gets a running start to do a dive but Momo jumps on the apron and kicks Miyagi in the head. Miyagi falls to the floor and Momo kicks her chest from the apron, Momo slides Miyagi back in and kicks her, but Miyagi slides out to the apron and snaps Momo’s head on the top rope. Miyagi pulls Momo onto the apron but Momo blocks the piledriver so Miyagi delivers a neckbreaker on the apron instead. Miyagi spits water into Momo’s face, she slides Momo back in the ring but Momo ducks her boot and hits a high kick. B Driver by Momo and she kicks Miyagi in the head, but she is too hurt to make a cover. They both slowly get up and trade elbows, they then trade slaps until Momo knocks down Miyagi with a kick to the chest. Momo goes off the ropes but Miyagi puts the referee in front of her and hits Momo with a chair. Scoop slam by Miyagi and she goes up top, delivering a Swanton Bomb for a two count cover. Miyagi grabs Momo around the waist and drops her with a tombstone piledriver, but again Momo gets a shoulder up. Miyagi goes off the ropes and dropkicks Momo in the back, she picks up Momo and goes for another tombstone, but Momo blocks it and rolls up Miyagi for two. Miyagi tries to get away but Momo delivers a release Tequila Sunrise, Momo picks up Miyagi and she nails the Peach Sunrise for the three count! Momo Watanabe wins and is still the champion. Even though nothing on this event crossed over into a MOTYC-type match, from top to bottom it was an entertaining show. The only average or worse matches on the card were Goya/Kagetsu and Rebel Kel/Utami, which was no surprise, with everything else ranging from fun to great. The main event being severely clipped was partly redeemed by Mayu/Natsuko being better than it had any right to be, I tip my cap to Natsuko Tora for really stepping up and giving Mayu all she had. I don’t know if it would be a great introduction show for new fans with the Gaijin being so prevalent in the title matches, but all in all an event worth watching.